Well, today we are going to learn about Tamar of Georgia, a Queen of Georgia centuries ago. 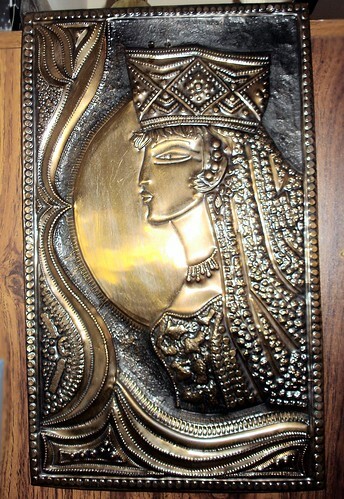 Tamar (Georgian: თამარი, also transliterated as T’amar or Thamar) (c. 1160 – 18 January 1213), of the Bagrationi dynasty, was Queen Regnant of Georgia from 1184 to 1213. Tamar presided over the “Golden age” of the medieval Georgian monarchy. Her position as the first woman to rule Georgia in her own right was emphasized by the title mep’e (“king”), commonly afforded to Tamar in the medieval Georgian sources. I was inspired to create this piece by one of the Georgian masters who taught me Art mixed with Georgian philosophy and peppered with its history. It was great time. I learned lots of stuff which I keep chewing over and over again, throughout the years. Eventually I departed from the life of an artist; the daily routine of worldly life won the battle over my soul — I was pardoned/punished? by kicked out from The Celestial Empire straight down to Earth, where I have happily been dwelling ever since.